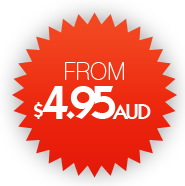 With 8 Australian Web Hosting Packages to choose from we've got you covered! This document sets forth the principles, guidelines and requirements of the Acceptable Use Policy ("AUP") of Internet Print Media Services ("IP Media") governing the use by the Client, their Employees and/or Third Parties (collectively, "Clients") of IP Media's systems, services and products ("Systems, Services and Products"). IP Media reserves the right to impose reasonable rules and regulations regarding the use of its services provided to all Clients and such rules and regulations are subject to change. The AUP is not an all inclusive exhaustive list and IP Media reserves the right to modify the AUP at any time as required. Acceptance of "Terms of Service & Use" binds all parties to IP Media's AUP at the time the contract is executed and as modified at any time. Any violation of the AUP may result in the suspension or termination of Clients account(s) or any other action as IP Media deems appropriate. No credits will be issued for any interruption in any services resulting from policy violations. VIOLATION OF ANY SECTION OF THE AUP IS STRICTLY PROHIBITED AND MAY RESULT IN THE IMMEDIATE TERMINATION OR SUSPENSION OF THE SERVICE(S) CLIENTS RECEIVES FROM IP Media Systems, Services and Products with or without notification. Any changes to the outlined policies and/or procedures will be updated here and all current Clients whom these changes impact upon will be notified of the changes by email. Clients shall not post, transmit, re-transmit or store material on or through any of Systems, Services or Products which, in the sole judgment of IP Media is (1) in violation of any local, state or federal law or regulation, (2) threatening, obscene, indecent, defamatory or that otherwise could adversely affect any individual, group or entity (collectively, "Persons") or (3) violates the rights of any person, including rights protected by copyright, trade mark, patent or other intellectual property or similar laws or regulations including, but not limited to, the distribution or storage of "pirated" or other software products that are not appropriately licensed for use by Client. Customer shall be responsible for determining what laws or regulations are applicable to its use of the Systems, Services and Products. Violations of network or system securities are strictly prohibited, and may result in legal action. IP Media investigates all incidents involving such violations and will cooperate with any law enforcement/investigatory agency if a criminal violation is suspected. • Introduction of malicious programs into the network or server (example: viruses, worms, Trojan Horses, key loggers, and other executables intended to inflict harm). • Effecting security breaches or disruptions of Internet communication and/or connectivity. Security breaches include, but are not limited to, accessing data of which the Customer is not an intended recipient or logging into a server or account that the Customer is not expressly authorized to access. For purposes of this section, "disruption" includes, but is not limited to port scans, flood pings, email-bombing, packet spoofing, IP spoofing and forged routing information. • Executing any form of network activity that will intercept data not intended for the Clients hosting space. • Circumventing user authentication or security of any host, network or account, including cracking. • Interfering with or denying service to any user, host, or network other than the Customer's host (example: denial of service attack or distributed denial of service attack). • Conduct designed to avoid restrictions or access limits to specific services, hosts, or networks, including but not limited to the forging of packet headers (spoofing) or other identification information. • Failing to comply with IP Media's procedure relating to the activities of Clients on the IP Media systems. Violators of the policy are responsible, without limitations, for the cost of labor to correct all damage done to the operation of the network and business operations supported by the network. Such labor is categorized as emergency security breach recovery and is currently charged at $110.00 AUD per hour required. Network interference by any Clients that may cause or is currently causing network interference with another Client will be disconnected immediately. No credit will be issued to Clients discontinued/suspended from services for any violations. Clients are responsible for the safe keeping of their usernames & passwords, disclosure of Clients login details to third parties in not recommended and if done is done solely at the discretion of the Clients and they will be held responsible for any activities caused by third parties. IP Media hosting space may only be used for lawful purposes. Transmission, distribution, or storage of any information, data or material in violation of laws, or by the common law, is prohibited. This includes, but is not limited to, material protected by copyright, trademark or other intellectual property rights; including creating, utilizing, distributing unauthorized copies of software, video, audio, etc, or the use of BitTorrent or other types of technologies utilized in the distribution of illegally copied materials. If Client copies, distributes or installs software in defiance of the license agreement, Client is violating federal copyright law. IP Media will cooperate with all law enforcement and/or investigatory agencies in relation to alleged copyright infringement involving Systems, Services and Products supplied by IP Media. Each Client is expected to execute reasonable Internet etiquette, the accepted behavior and expectations of the Internet community. The Client will comply with the rules appropriate to any network to which IP Media may provide access. The Client should not post, transmit, or permit access to information the Client desires to keep confidential. The Client is not permitted to post any material that is illegal, libelous, and tortuous, indecently depicts children or is likely to result in legal ramifications or retaliation against IP Media by offended users. IP Media reserves the right to refuse or terminate service at any time for violation of this section. This includes advertising services or sites via IRC or USENET in clear violation of the policies of the IRC channel or USENET group. • Hosting web pages that detail the methodology of committing unlawful acts, or acts violating this AUP. • Hosting software, scripts, or other resources intended to facilitate committing unlawful acts, or acts violating this AUP. • Advertising, transmitting, storing, or using any software, script, program, product, or service designed to violate this AUP. • Harvesting. The collection of email addresses, credit card information, or other personal information for fraudulent use or sale is prohibited. • Phishing. Hosting web pages with forwards to, containing scripts or executables for, or any other component of an operation designed to fraudulently collect authentication, credit card, names, addresses, or any other personal data is not permitted. • Users are responsible for any scripts that are uploaded into your hosting space and the security of such scripts. Any disruption to the function of the web servers or breaches of security due to insecure scripts will be cause for immediate termination of your account and possible legal action to recover costs involved in recovering services affected by these scripts. Accounts that reach monthly allocated bandwidth usage for 2 consecutive months will be automatically upgraded to the next hosting package. Termination of any service by the Client must be done in writing minimum 14 days before next billing cycle. Email Spam. IP Media has a zero tolerance policy on SPAM, Junk E-mail or UCE. Spam, Junk-mail and UCE are defined as: the sending of the same, or substantially similar, unsolicited electronic mail messages, whether commercial or not, to more than one recipient. A message is considered unsolicited if it is posted in violation of a newsgroup charter or if it is sent to a recipient who has not requested or invited the message. UCE also includes e-mail with forged headers, compromised mail server relays, and false contact information. This prohibition extends to the sending of unsolicited mass mailings from another service, which in any way implicates the use of IP Media whether or not the message actually originated from our network. Block Removal. If Customer actions have caused IP Media mail servers or IP Media IP address ranges to be placed on black lists and other mail filtering software systems used by companies on the internet, Clients will be issued a $100 AUD charge to Clients account and $100 per hour for administrative charges incurred to remove and protect mail servers and IP ranges. Drop-Box Accounts. Using our servers for the receipt of replies to unsolicited mass email (spam) sent from a third-party network is prohibited. Header Forgery: Forgery of email headers (spoofing) is prohibited. No ISP, Wireless or similar companies are to use the IP Media mail servers for customer mail servers. Sending mass unsolicited email is considered spam. Unsolicited email is defined as email sent to a recipient who has not requested or invited the messages from the Client. Senders of mass mailings must maintain complete and accurate records of all opt-ins(email subscription), including the email and its headers if applicable, and provide such records to IP Media upon request. If positive and verifiable proof of opt-in/subscription cannot be provided, complaints from recipients of the mailing are considered proof they did not subscribe and the mailing is unsolicited. IP Media's mass mailing rules also apply to mailing lists, list servs, or mailing services contracted for by Clients. The policy is stated as follows: An acceptable mailing list will be focused at a targeted audience that has voluntarily signed up for e-mail information using a double opt-in process or that has made their e-mail address available to Customer for distribution of information. The list must also allow for automatic removal by all end Customers with non-distribution in the future. By agreeing to this AUP, Client affirms that the contact and payment information provided to Ip Media identifies Client and that Client is authorized to use the payment method provided. Commitment of fraud, obtaining services, or attempting to obtain services by any means or device with intent to avoid payment is prohibited. Any instances of this will reported to the relevant authorities and may result in legal action. IP Media does not allow IRC plug-ins, scripts, add-ons, clones or other software that has the intent or effect of disrupting or denying service to other users. Harassing, disrupting or denying service to other users is expressly prohibited, and will result in the cancellation of Client account(s). Resellers are responsible for the conduct of their Clients and by agreeing with this AUP, agree that their Clients will adhere to the AUP. Resellers should make their prospective Clients aware of the AUP and the consequences for violations of any section of the AUP. IP Media will use reasonable care in notifying the Client and in resolving any problem in a method resulting in the least amount of service interference as reasonably possible. IP Media reserves the right to suspend any service to any Client for violation of the AUP without notice. Maine Hosting Solutions reserves the right to terminate service without notice for any account that impacts the availability of Systems, Services and Products provided by IP Media to others in a shared hosting environment. Suspension for non payment: Any account, service or product Past Due its renewal date may be suspended for non payment. When an account is suspended all web hosting, promotion, design, updates, and email services are put into suspension until payment is brought current. Upon suspension, notices may be emailed every 5 days for 60 days prior to termination. Termination for non payment: Any account Past Due and currently suspended for 60 days may be terminated for non payment of services. In the case of an account being terminated all files and email will be removed from the server and may not be retrievalble from backup. IP Media sends out 60, 30, 15, 5, and 1 day payment due notices via email to ensure you are notified of any payments due. It is the responsibility of the Client to keep their contact information up to date as to avoid non receipt of these payment due reminders. Domains will be registered for clients at a minimum registration period dependent on the TLD. Unless otherwise notified, renewal of domain names is done automatically for IP Media clients within 30 days of the domain expiration date. Cancellation of a domain name registration must be received a minimum of thirty days prior to renewal. The registrant will be responsible for payment of an additional registration fee if the domain has already been renewed. IP Media will maintain the domain name registration for as long as the account is paid in full. IP Media will perform changes to the domain name record at the clients request or where required at the sole discretion of IP Media. Redemption: If a domain goes into redemption after not being renewed there may be a $100 AUD fee to remove the domain from redemption. • Immediate disconnection of service(s) with no re-activation. • Upon termination of an account, your right to use the account and the Service(s) immediately ceases. IP Media has no obligation to maintain any Data stored in your account or to forward any Data to you or any third party.